Gladiator packages are designed to provide customers with a high-end finish whilst helping eliminate those pesky storage problems. Our packages have been prepared with the Australian market in mind. All our packages are expandable as your needs grow. Whatever your garage storage problem, Gladiator has the solution. 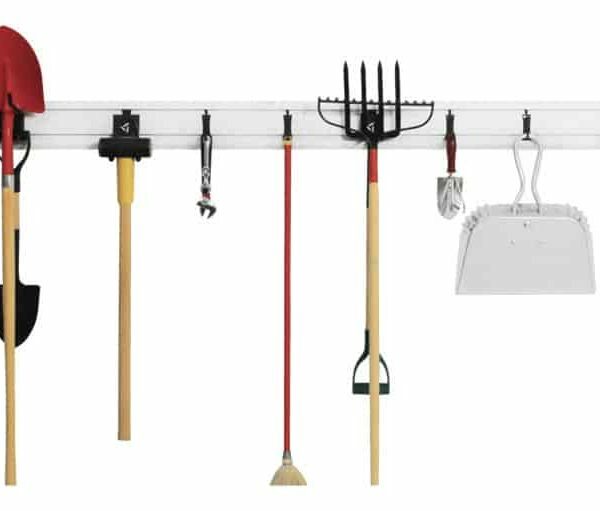 Designed to work with our patented, heavy-duty Gladiator® Wall Systems (GearTrack® Channels and GearWall® Panels), all of our Kits and Accessory packs feature easy-to-arrange hooks and baskets to tame all your garage clutter. Using our wall systems and Kits means your gear and tools will stay firmly in place on your garage wall and will provide you with the ultimate flexibility in wall storage. Our Kits and Accessory Packs are all designed to help you get started on that garage organisation project. Whether you are just starting out and need a place to begin, or have a GearTrack Channel or GearWall Panel already installed, our Kits and Accessory Packs offer you a variety of hooks and baskets to create safe, stylish, and flexible storage for everything in your garage. If you’re just starting your organisation project, the Gladiator GearTrack Starter Pack is a great choice. If you already have a channel or panel and have just a few things you want to store, the Accessory Kit 1 offers the perfect options, while Accessory Kit 2 has more accessories to help you organise even more gear and tools. All of our Kits and Accessory Packs feature a variety of hooks to manage many different types of tools and equipment and also work well with existing room packages. Whether you are looking to organise garden tools, sports equipment, camping gear, power tools, or anything else in your garage, these flexible and durable Kits and Accessories are a great first step or a wonderful add-on to your Gladiator GarageWorks system. Tackle the gear piled in the corner and get it up on the wall, where you can access and use it easily.